Today, with so many flooring options, choosing the right one can be really hard. When it comes to choosing flooring option for your bathroom, there are different styles, designs, patterns, colours, material so you can never tell whether ceramic tiles are better option than the bathroom vinyl floor tiles. Both flooring options have advantages and disadvantages, but which one you will choose will depend on your personal needs and your budget, of course. After all, even interior designers and tile suppliers find it hard to decide which one is better. If you are planning on remodeling your bathroom, then it would be ideal to get familiar with both flooring options. Advantages And Disadvantages Of Ceramic Tiles – Since the ceramic tiles have been on the market longer than the bathroom vinyl floor tiles, it is only normal for them to be the favorite choice for many. Ceramic tiles never go out of fashion, once installed they remain for many years to come. But trends are one thing and quality and durability completely another thing. But resistance is not a problem for the ceramic tiles as they are one of the most durable, fade/stain and scratch resistant floor option available on the market. One of the main disadvantages of the ceramic tiles is their toughness and hardness. Dropped objects can damage the tiles, making the ceramic tiles not a good flooring option for bathrooms especially if you have kids. Advantages And Disadvantages Of Vinyl Tiles – The bathroom vinyl floor tiles are on the path to replace the ceramic tiles completely. Why spending a fortune on ceramic tiles, when you can buy inexpensive luxury bathroom vinyl floor tiles that offer quality and unique look. It is not only inexpensive alternative compared to the ceramic tiles, but also a warmer and softer floor option for your home. Bathroom vinyl floor tiles are stain resistant and easy to clean, which means you won’t have to spend too much time on maintenance. Ideal for bathrooms as they are water resistant and waterproof. 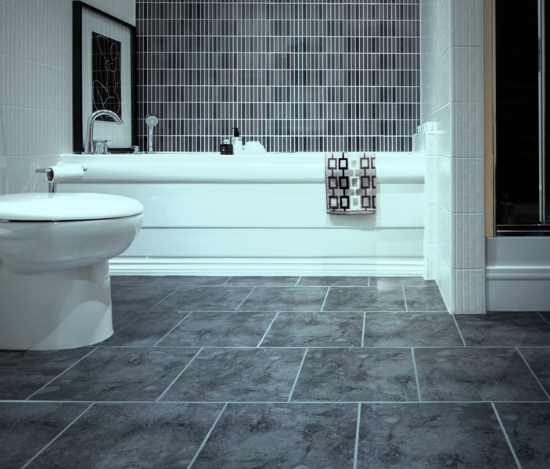 Furthermore, the bathroom vinyl floor tiles come in various designs, patterns, colours and sizes. You can choose to either install the vinyl tiles with or without grout for a true ceramic look. And even though they are a smooth surfaced flooring, the bathroom vinyl floor tiles are not prone to scratches.